One of the things I know about Thomas Dane Gallery – apart from stuff like where it is and that I’ve seen some great shows there – is that it closes at 4pm on a Saturday. I know this because I am disorganised and find 4pm a bit too early. On my way in to town last weekend I double-checked the website just in case and noticed that the gallery was open until 6pm which made it possible to both have a late lunch and get to the Tony Morgan show. This was cheering news. Arriving at the gallery, I pressed the buzzer and pushed the door. It was true. I was in! Upstairs in the gallery there were quite a few people about and quite a lot of chatting. Everyone seemed to know each other and I wasn’t completely sure I was meant to be there. Setting my doubts aside, I headed off to look at the work. I noticed with dismay that the 16mm film projectors seemed to be turned off in the largest space but there were wall-based works to look at and in the small back room there were works on monitors. I didn’t get to see all these properly because the presence of a group of visitors made accessing the headphones tricky but the work I did see made me smile – well Lash, in which Morgan strokes the ultra-long false eyelashes that seem to connect him to the camera, made me smile; Volcano was kind of brilliant and kind of unpleasant to watch, on balance I rather loved it – even if I was sad to miss the films. On my way out I took a quick look at the set-up in the space with the film projectors. As I entered the room the projectors whirred into life and the magic of, well not cinema exactly, but film anyway was all around me. 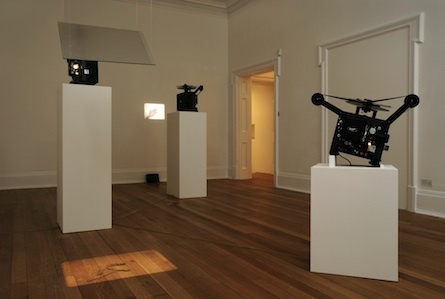 The three works here are all very simple but very effective; all use 16mm projection in different ways to activate the gallery space and I am entranced by the space and delighted not to have missed what now seems an extra special experience. In Wall Slap a hand repeatedly slaps the wall; in Paper Drop, projected straight down onto the floor using a mirror, a scrunched up piece of paper repeatedly lands on the gallery floor. Though I know that this is not the case, I’m slightly convinced I saw it fall. Black Corner lights up and then darkens a low corner of the space. The surprise of encountering these works when I thought I’d missed my chance made the experience of seeing them that bit more pleasing. It seems confusion can be useful when it comes to seeing art. 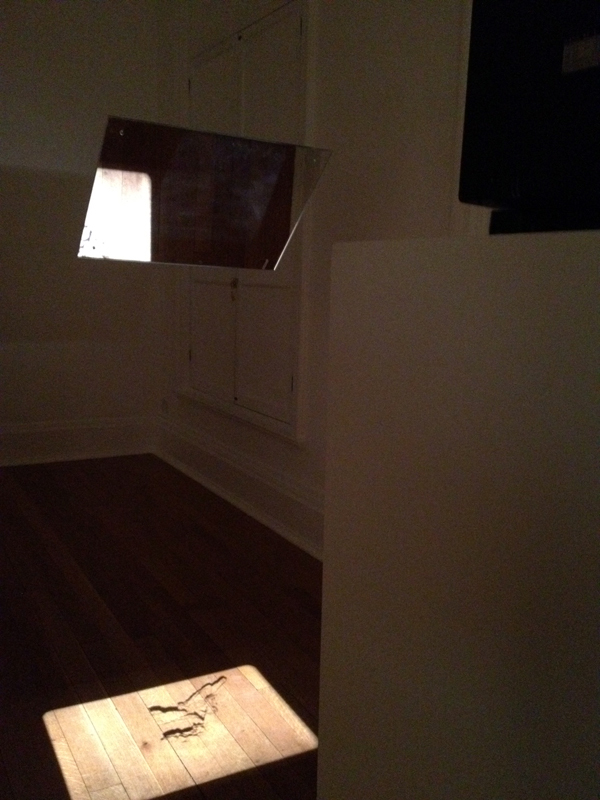 Tony Morgan, projections of Wall Slap, Paper Drop and Black Corner at Thomas Dane Gallery. This entry was posted in Film/Video, Installation and tagged 16mm, art, Black Corner, film, Hand Slap, Lash, London, Paper Drop, Thomas Dane, Tony Morgan, video, Volcano by Ann Jones. Bookmark the permalink.